Once in a while, Big Finish releases something potent, something absorbing and something attracting the label of future classic. 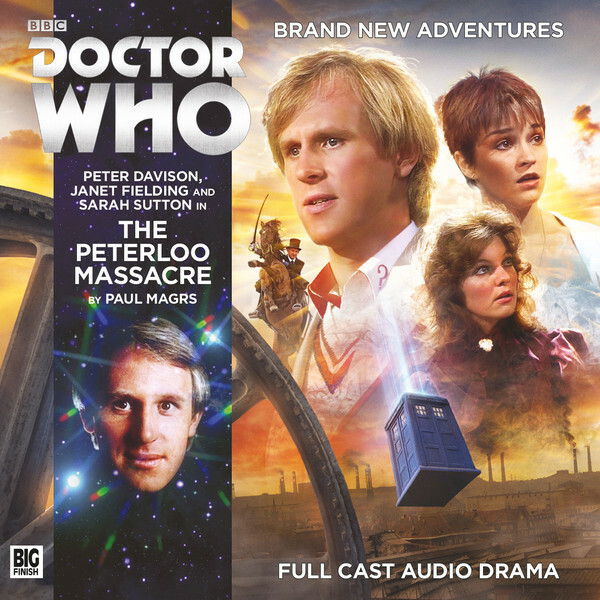 The current Fifth Doctor trilogy has been good (Waters of Amsterdam and Aquitaine), but The Peterloo Massacre by Paul Magrs is magnificent. It’s a pure historical and gives clear roles for both Nyssa and Tegan, and tells a dark true story from English history in an intimate, accessible manner showing great craft, skillful directing and great acting. The events of the historic Peterloo Massacre are well documented, and rather than reprise them here, I’ll direct you to the wikipedia entry on the subject. Events unfold as they have to; the Doctor cannot change fixed points in time, and through their interactions with the Hurley family the TARDIS crew engage the listener in the unfolding horrors of 16 August 1819. It is a grim, dark episode in history and the story makes no punches. We get a strong sense of the injustices of the society as a contemptuous moneyed class marches towards the Massacre and through the lens of the Hurley family, their servant Cathy and those around them, the horror of the day becomes personal and shocking. Nobody involved is untouched by events; there is no happy ending here. Of course the Doctor can’t just be an observer, and while the massacre itself is sacrosanct, he at least manages to dampen down some of the consequences for the Hurleys, though this is by making them face up to some unpleasant truths. He also helps to make sure events are documented in the press. There is an enormous amount to admire with this release, from Paul Magrs’s writing, Jamie Anderson’s direction, Nigel Fairs’s sound and music, all the cast and even Simon Holub‘s cover all contribute to a single, coherent experience. None of the cast can be singled out, so here they all are: Peter Davison, Sarah Sutton, Janet Fielding, Hayley Jayne Standing, Robbie Stevens, Gerard Kearns, Philip Labey, Wayne Forester and Liz Morgan. As a writer myself, I’d like to focus on Paul Magrs’s crafting of this outstanding tale. Given the political nature of the material, it would have been easy to tell a big angry story, have Tegan shout a lot and present events without drawing the listener in as deeply as he has. Let’s consider Paul Magrs for a moment; pop over to his wiki entry (Paul Magrs on wikipedia) and realise he understand the inner mechanics of storytelling. Each of the Doctor, Nyssa and Tegan plays this story true to character but is blunted by events. Instead of writing them with the dial twisted up to the maximum, each is toned back slightly and allows those around them to deflect and inform. Tegan gets angry but not ridiculously so; she ends up in gaol and railing against injustice. Nyssa gets to form bonds with poor Cathy and explore the damning after effects of the massacre and see how every aspect of society is against those most in need of support. She also acts as the channel back to Mrs Hurley and speaks a hidden truth of the relationship between Cathy the servant and the Hurley’s son. It is the Doctor who steals the show with one of Peter Davison’s strongest few scenes. Between parts 3 and 4 he seems to burn with an incandescent rage, held in through discipline and knowledge of the inevitability of events. His rounding on Hurley shocks with the implied threat of the moment and we get a glimpse of what it means to be constrained by the web of time. I could say more, but all I need to say is listen for yourself. If you disagree I’d like to know why. In my view this has been one of the best main range trilogies for some time and quite possibly the best Fifth Doctor trilogy ever released. With so much Big Finish attention rightly focussed on Torchwood and new licence productions, the main range is thriving. Long may it continue, and please bring back the team behind this story as soon as possible.